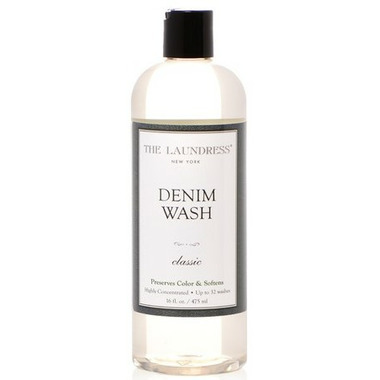 The Laundress Denim Wash cleans, softens, and preserves colour, leaving your denim with that perfect worn-in feeling. We invest a lot in our denim, so The Laundress developed this unique wash that blends detergent, fabric conditioner, and color guard to clean and protect it properly! The Laundress start-to-finish laundering collection is scented in Classic, the ultimate “clean laundry smell”, blending lily of the valley and jasmine with sweet musk, sandalwood, and a touch of citrus. Directions: Effective in all water temperatures. It's recommended washing colored denim in cool water and white denim in hot water. If machine washing, turn items inside out and insert in a Mesh Washing Bag (optional). Hang dry, or tumble dry on low heat. Ingredients: Plant-derived anionic and nonionic surfactants, plant-derived softener (canola-based), essential oils, and fragrance. I like it: cleans very well; no colour fading so far. A little bit goes a long way.